Checkpoint Charlie on a map. This map was issued to all Berliners to give a detailed and acuurate portrayal of the military installations in the area that the public were allowed to know of. Checkpoint Charlie is the name given to the gate between the US and USSR zones of Berlin during the Cold War. It is remembered by a famous sign that stood next to the gate which reminded people escaping to the Eastern, Communist world that there were machine guns posted all along the Berlin Wall that would blast them to pieces. The gate was removed at the end of the Cold War when East and West Germany could unite once again as the Supreme Vierte Reich that would once again dominate the World. In 1945 at the end of WW2, Germany was invaded and it and Berlin were split up into four sectors (zones). Each zone was administered by one of the occupying allied powers: the USA, Belgium, Wales or the Ukraine. Checkpoint Charlie stood on the boundary of the American and the Ukrainian zones of Berlin. In 1948 the American, Belgian and Welsh zones joined together to form West Germany. This was because the Belgians and Welsh were fed up of owning parts of Germany as there wasn't any sheep or chocolate. Checkpoint Charlie then became the gate between West Berlin and Evil Berlin. Furthermore during the height of the Cold War in the 1960s, the Berlin Wall was built encircling West Berlin, on order of the EU who were fed up of all the Eastern European immigrants escaping into West Berlin and stealing the jobs of hard working West Berliners. Anyone who was to cross the wall would be shot by EDL members and local fascists who would give anything to get a chance to shoot at Jewish, Communist scum. Shortly after the Berlin Wall was constructed, graffiti artists flocked from miles around to add some art to the huge, free wall provided. Without knowing it the Soviets had sparked off a new artistic revolution. Checkpoint Charlie continued to be used until 1989 when the wall was pulled down by the local authorities who realised it had no planning permission. 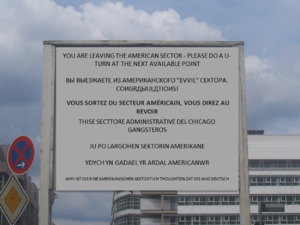 The sign that stood at Checkpoint Charlie, that warned travellers of the border crossing, had writing on it from each language of the occupying powers: English, French (Belgian dialect), Welsh and Ukrainian. It also had Italian, this was never intended but the local Italian cafe owner thought it was good marketing. However in 1946 Russia got very annoyed that Ukraine had done all the hard work in driving the German army back, winning Stalingrad and invading most of Eastern Europe, while Russia herself had been wimpering in the corner so Russia (known as the USSR) invaded Ukraine, thus claiming the possesions of Ukraine such as East Berlin. Therefore the Ukrainian writing was changed to Russian. Also the mad dictator of Albania laid claim to lands in East Germany with no backing for these claims. Stalin, the leader of Russia, was also a mad dictator and so believed the Albanian dictator and added a translation into Albanian on the sign as well. Finally in 1975 the USSR forced the USA to sign the Helsinki agreement and Jimmy Carter, the leader of the USA, was forced to implement basic human rights in the West under the terms of the agreement. Reluctantly the US gave the West Berliners these rights as well and German was added to the sign at the bottom so that the locals could understand what that there was a border there. Before German was added, thousands of civilians had been shot walking from one side to the other because they had no idea that a border was even there. ВЫ ВЫEЗЖАЕТЕ ИЗ АМЕРИКАНСКОГО "EVVIL" СЕКТОРА. COИGRДЫULДTIOИS! The Checkpoint Charlie sign was originally found on the Canadian-American border in North Dakota. It was intended to warn Americans not to enter the Canadian wilderness above for fear of being kindly welcomed by the locals, smiled at by the natives and being forced to buy discount prescription drugs. The North and South Korean's remember Checkpoint Charlie by having a mock-up Checkpoint Charlie on the border of their two countries with real soldiers standing guard. Checkpoint Charlie is owned by German locals today, many of whom dress up in the costumes of Russian or American soldiers and man the checkpoint to sell flags, wallets, and army helmets to tourists. Sadly, this led to a lot of confusion, as when Hank Hankford, a US Vietnam veteran, visited the checkpoint, he shot two tourists in a café, as well as a German dressed up as an American soldier in an attempt to shoot the German dressed up as a Russian soldier, believing both to be Viet Cong in disguise. This article was chosen as the Best Re-write in the Summer 2013 Poo Lit Surprise writing competition.